This article is about a figure in the Bible. For other uses, see John Mark (disambiguation). John Mark is named in the Acts of the Apostles as an assistant accompanying Paul and Barnabas on their missionary journeys. Traditionally he is regarded as identical with Mark the Evangelist. 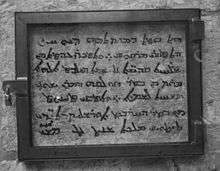 6th-century Syriac inscription at the Monastery of St. Mark on Zion, beginning, "This is the house of Mary, mother of John Mark." From these passages it may be gathered that John's mother Mary had a large house in Jerusalem to which Peter fled after escaping prison; that John assisted Paul and Barnabas on their first missionary journey to Cyprus and as far as Perga in Pamphylia, but then returned to Jerusalem; and that later controversy over receiving John Mark back led to Paul and Barnabas parting ways, with Barnabas taking Mark back to Cyprus and both thereafter disappearing from the narrative of Acts. The reasons for John Mark's departure to Jerusalem and the subsequent disagreement between Paul and Barnabas have been subject to much speculation. Matthew Henry, for example, suggested that John Mark had departed "without [Barnabas and Paul's] knowledge, or without their consent". However, there is simply too little data to regard any explanation with confidence. It was common for Jews of the period to bear both a Semitic name such as John (Hebrew: Yochanon) and a Greco-Roman name such as Mark. But since John was one of the most common names among Palestinian Jews, and Mark was the most common in the Roman world, caution is warranted in identifying John Mark with any other John or Mark. Ancient sources in fact consistently distinguish John Mark from the other Marks of the New Testament and style him Bishop of Byblos. Nor was John Mark identified in antiquity with any other John, apart from rare and explicit speculation. Medieval sources, on the other hand, increasingly regarded all New Testament references to Mark as Mark the Evangelist, and many modern scholars have agreed in seeing a single Mark. The very fact that various writings could refer simply to Mark without further qualification has been seen as pointing to a single Mark. First, there is Mark the cousin of Barnabas, mentioned by Paul as a "fellow worker" in the closings of three Pauline epistles. In antiquity he was regarded as a distinct Mark, Bishop of Apollonia. If, on the other hand, these two Marks are to be identified, the fact that these epistles (if authentic) were written after the departure of John Mark with Barnabas in Acts must suppose some later reconciliation. But a majority of scholars, noting the close association of both Marks with Paul and Barnabas, indeed regard them as likely the same person. Mark the Evangelist, however, is known only from the patristic tradition, which associates him only with Peter and makes no mention of Paul. 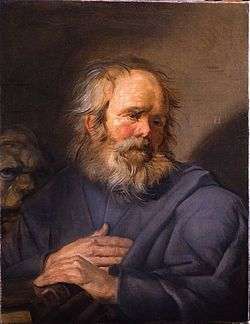 Jerome alone suggests that the Mark of whom Paul speaks may be the Evangelist. But modern scholars have noted that as Peter fled to the house of John Mark's mother, the two men may have had a longstanding association. Several scholars have argued, on the other hand, for identifying John the Evangelist and/or John the Elder with John Mark; there is, in fact, a great deal of controversy surrounding the various New Testament people named John. The Acts of Barnabas, apparently an apocryphal work of the 5th century, purport to be written by John Mark and to detail the missionary journey and martyrdom of Barnabas in Cyprus, thus picking up where the account of Acts leaves off. The Encomium of the Apostle St. Barnabas, written by Alexander the Monk in the 6th century, also gives an extensive account of the activity of Barnabas and John Mark in Cyprus. After the death of Barnabas, John Mark leaves for Ephesus, and the account then continues by identifying him with Mark the Evangelist. 1 2 3 Butler, Alban; Attwater, Donald; Thurston, Herbert, eds. (1956). Butler's Lives of the Saints. 2. p. 162. ↑ Black, C. Clifton (1994). Mark: Images of an Apostolic Interpreter. pp. 26–44. ISBN 0872499731. ↑ Bauckham, Richard (2006). Jesus and the Eyewitnesses: The Gospels as Eyewitness Testimony. p. 83. ISBN 0802831621. ↑ Bauckham (2006), p. 416. ↑ Boring, M. Eugene (2006). Mark: A Commentary. New Testament Library. p. 11. ISBN 0664221076. ↑ Lee, G. M. (1975). "Eusebius on St. Mark and the Beginnings of Christianity in Egypt". Studia Patristica. 12: 422–431. 1 2 3 Bruns, J. Edgar (1963). "John Mark: A Riddle within the Johannine Enigma" (PDF). Scripture. 15: 88–92. 1 2 Pseudo-Hippolytus, On the Seventy Apostles, for example, disguishes "Mark the Evangelist, Bishop of Alexandria" from "Mark cousin of Barnabas, Bishop of Apollonia" and from "Mark, who is also John, Bishop of Bibloupolis". ↑ Dionysius of Alexandria, apud Eusebius, Hist. Eccl. 7.25.15, speculates in passing on what other Johns there were besides John the Evangelist who might have written Revelation. John Chrysostom, In Acta Ap., Hom. xxvi, seems to suggest that John Mark was the John who accompanied Peter in Acts. ↑ Bruns, J. Edgar (1965). "The Confusion Between John and John Mark in Antiquity" (PDF). Scripture. 17: 23–26. ↑ Black (1994), pp. 15–16. ↑ Bauckham (2006), p. 206. ↑ Phlm 1:24; Col. 4:10; 2 Tim 4:11. ↑ Black (1994), pp. 185–186. ↑ Jerome, Comm. in Philem. 24. ↑ Black (1994), p. 165. ↑ Black (1994), p. 28. ↑ Culpepper, R. Alan (1994). John, the Son of Zebedee: The Life of a Legend. p. 87. ISBN 0872499626. ↑ Czachesz, István (2007). Commission Narratives: A Comparative Study of the Canonical and Apocryphal Acts (PDF). Studies on Early Christian Apocrypha. 8. pp. 184–207. ISBN 9042918454.